Mission La Purísima Concepción was founded 8 December 1787 (11th in order) by Padre Fermin Francisco de Lasuén. The mission is named for The Immaculate Concepción of Mary the Most Pure. The Indian name was Algsacupí. 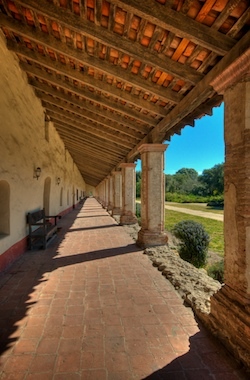 The current mission is a restoration of portions of the 1812 earthquake reconstruction when the mission was moved from its original location about four miles to its present location. The mission is a State Historical Park and is one of the most complete mission restorations; including 25 miles of hiking and riding trails. Periodic craft demonstrations are given by docents during the summer. There is no active church at the mission. The mission is on the North side of Lompoc. From U.S. 101 take the Highway 246 exit at Buellton and head West approximately 14 miles. Just before Lompoc 246 will veer to the left; take Purisima Road to the right. The mission is a short distance from the intersection at 2295 Purisima Road. If traveling on Highway 1 you’ll need to take Purisima Road from the North or 246 from the South as indicated on the map below (California Landmark 340). Note: Due to impending budget cuts, mid-2009 finds us again with the possibility of the Mission as a State Park being closed. If you care to comment about this action please contact the Governor and legislators and express your opinion.